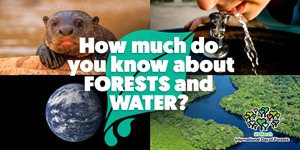 How much do you know about forests and water? Find out more about how forests contribute to our water needs by reading our key messages on forests and water. Looking for ways to take part in the International Day of Forests? Here are five ideas. 2. Take this year’s forest quiz – How much do you know about forests and water? – and share your results on social media. See how people around the world are celebrating the International Day of Forests, and send us photos of your event at idf@fao.org. The United Nations General Assembly proclaimed 21 March the International Day of Forests. The Day celebrates and raises awareness of the importance of all types of forests. On each International Day of Forests, countries are encouraged to undertake local, national and international efforts to organize activities involving forests and trees, such as tree planting campaigns. Click here for the full text of the UN Resolution. The theme for each International Day of Forests is chosen by the Collaborative Partnership on Forests.